I have been a huge fan of Caroline Z. Hurley's textiles ever since I first stumbled upon her beautiful pieces at one of my favorite places to shop in New York, Calliope. 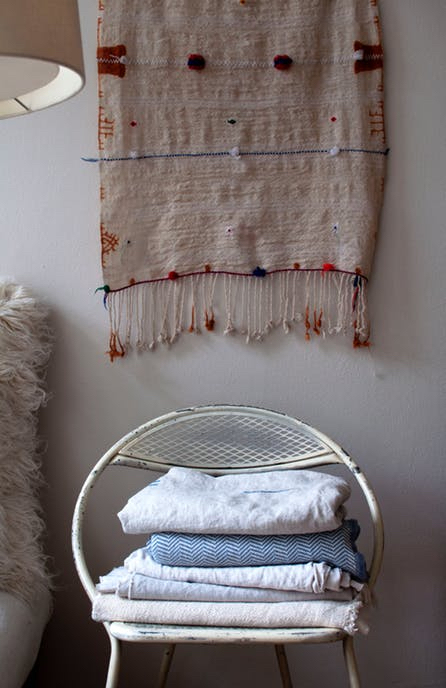 Over the years I've picked up a number of her machine washable, cotton rugs for my Costa house, and I recently used a few of her blankets in my Cape project. I love the global feel that these textiles bring to my projects, and the softness they can bring to a space. Her pieces are warm, earthy and the workmanship and quality is visible in each one. Her pieces are on the higher side, but given that her goods are handmade you can see why. If there is any question what these textiles can do for a space, look no further than Hurley's own West Village studio apartment. 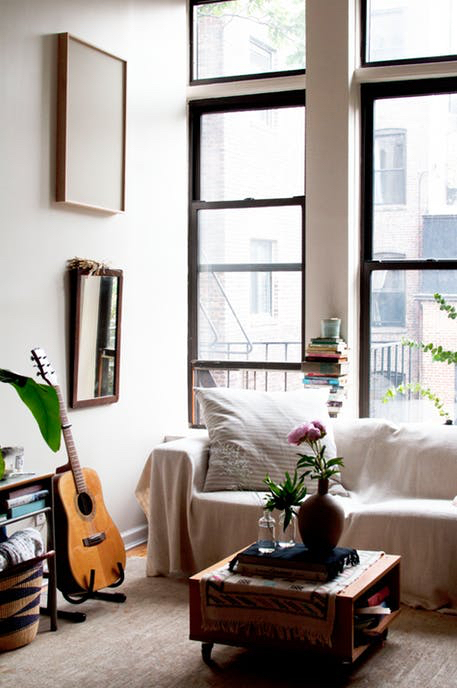 While small in size, coming it at 420 sq feet, Hurley's home is chocked full of character and is pretty much my dream apartment if I were single and living in the city. 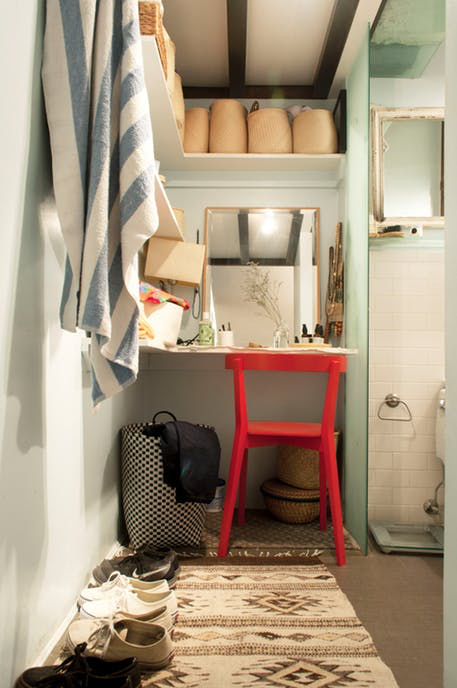 Her home is the perfect backdrop for her inspired pieces and you can tell that she loves what she does as her textiles can be found in every corner of this tiny home. It's important to note that many of Hurley's products are globally sourced and made in collaboration with women in countries like Guatemala and Mexico. I would be remiss if I didn't take this time to add my sentiments to the chorus of voices who are heartbroken and alarmed by what is happening to the immigrant children in our country right now. These families are being torn apart after seeking legal entry into our country and are being treated like criminals. This isn't a political issue, but rather it's a human one, and it's one that I never thought I would see in my lifetime. The obvious correlation to The Holocaust is one that we can't ignore, and I believe the worst thing we can do is stay silent right now. I've been making donations to ActBlue which splits contributions among various charities that are on the ground fighting this inhumane policy. In addition, I found this piece very informational and if you are looking for ways to help this is a good place to start. 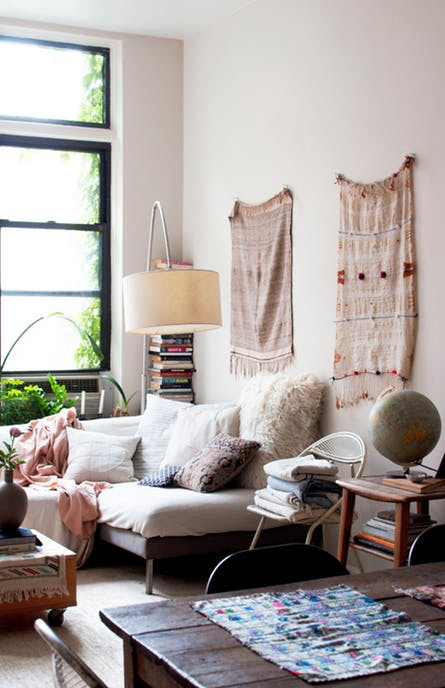 Hurley's studio via Apartment Therapy. Her online shop can be found here.